Okay, we took about 3 weeks to release this episode, but it’s twice as long as the others. So it’s almost like we’re on time! You can download the episode directly, subscribe to our RSS feed or get it from iTunes. We kick off our news segment with Funimation’s decision to censor the Dance in the Vampire Bund DVD’s (which they quickly reconsidered), followed by short discussions of Media Blasters’ layoffs and whether the American anime industry should just die. Paul “Otaking” Johnson’s fansub documentary closes out the news and provides us with a topic Ryoko, Shamisen and I can agree on before we start arguing about The Wings of Honneamise and Cromartie High School. Next time: Project A-Ko! Casshern Sins! And punctuality (maybe)! You can download the episode directly or subscribe using our RSS feed or the iTunes store. For this episode, we talk about the legality (or lack thereof) of the Chris Handley case that’s been going on for two years now, followed by our thoughts on whether Nippon Ichi Software America’s venture into anime licensing will succeed. Then, in the review section, we trip out on Interstella 5555 and bravely don our flame-shields to give our mixed opinions on Lucky Star. This is the latest entry in the ongoing saga. So, that obscure reference to an anime store that Jon mentioned not quite understanding? The Anime World Order explained it in their review. The shownotes I just linked to have comparison videos of the joke, too. 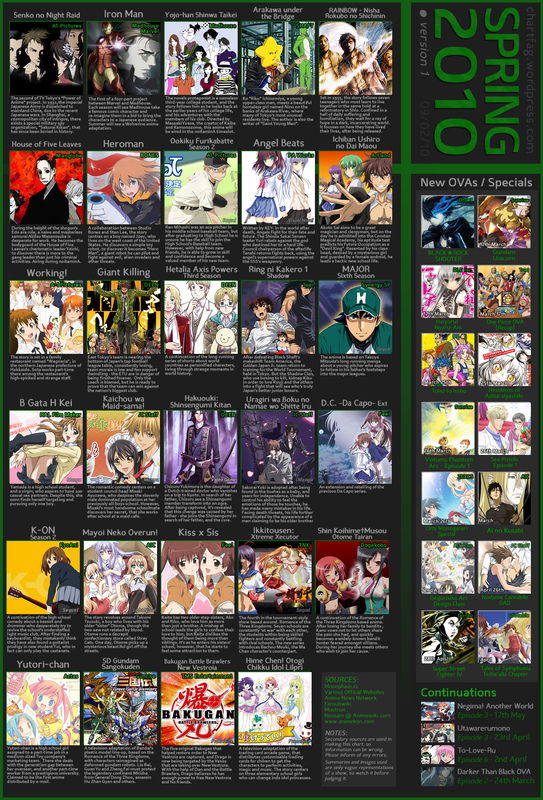 chartfag released a new anime season chart. Thanks, chartfag! Click here for the direct download or subscribe to the RSS feed. On this episode of Bakacast, we go from super-serious to super-goofy in the span of one LOST episode. First, we use this article on the Akihabara killer as a springboard to talk about…well…a lot of stuff. Then, we discuss Blu-Ray sales going up and what that might mean for our anime collections. Plus, the ASOS Brigade is back with a new voice actress for Haruhi. Finally, we wrap the show up with our finalized impressions on the Silent Mobius movies and a review of the Dirty Pair TV series. Be sure to watch the clean OP that Jon/Ryoko uploaded. It’s disco-riffic and perfectly encapsulates the style of the show. This is the first “real” episode of Bakacast (the chronologically first episode was a proof of concept), a podcast hosted by Shamisen, Ryoko and myself. For this episode, we talk about alien designs in both Japanese and Western media, a point-and-click adventure game called The White Chamber and first Silent Mobius movie. Shownotes for this episode are after the break. Click the image to download the podcast directly, or subscribe to our RSS feed here. 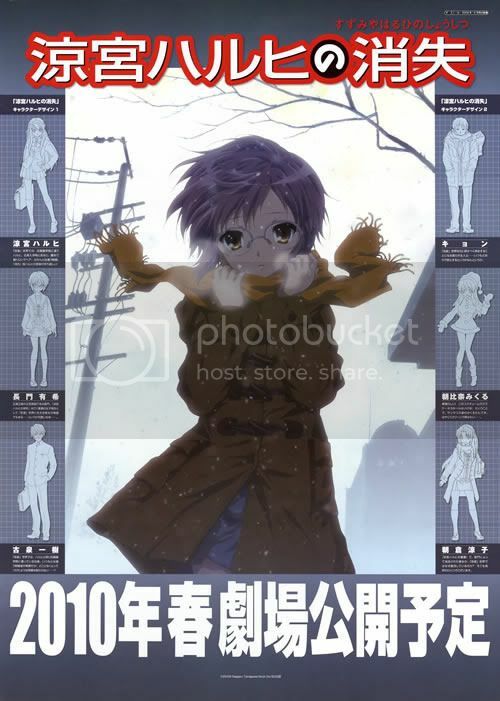 Okay, so we do not yet have a trailer for the up and coming film, The Disappearance of Haruhi Suzumiya. Instead we have a newly released poster with some character sketches of the main characters in and around the SOS Brigade. Located in the margins, some lucky sod scanned the whole thing in high enough resolution for our viewing pleasure. See the sketches after the jump. 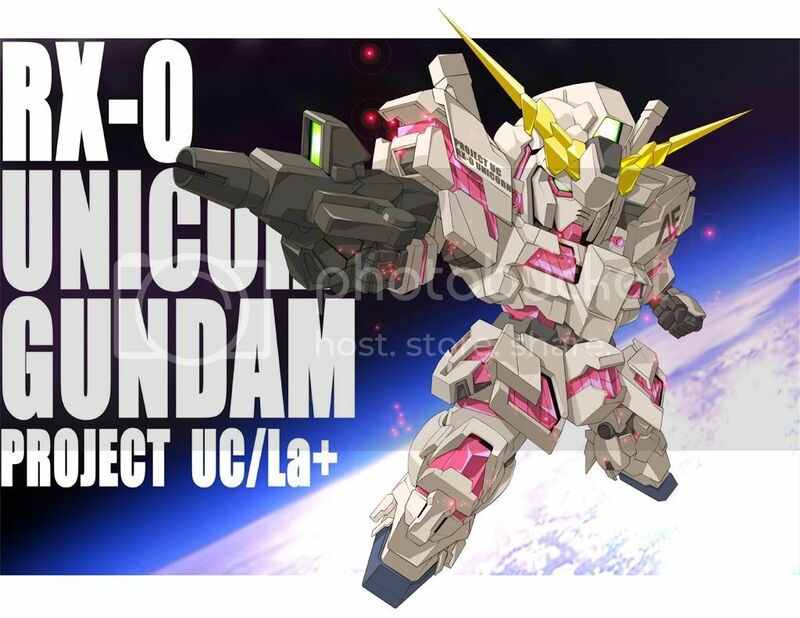 Bandai is really pulling out all the stops for Gundam Unicorn. They revealed today that the Blu-Ray version will receive a simultaneous international release, and will include both English and Japanese dub tracks, as well as subtitles in Japanese, English, French, Spanish and Chinese. Those of you without Blu-Ray players, however, will have to suffer through the English subtitles, as the regular DVD release contains only Japanese audio. Bummer, I know how much you otaku hate subtitles. As a Gundam fan, I would love to provide you with a detailed analysis of Bandai’s international release strategy… but I’m too busy squealing like a fangirl. SQUEEEEE!!! It might be a slow news week, but you can still enjoy this amazing Lucky Star dance flash I plucked off Danbooru! Go ahead, play with it a bit. It’s quite addictive. The flash appears below the break. Be warned, it’s pretty loud, so if you’re at work you might want to break out the headphones. 4th Annual Seiyu Awards Voting is Open! Voting has begun for the 4th annual Seiyu awards, which allows fans to pick their favorite Japanese voice actors and actresses. For the second year in a row, the Tokyo Anime Center is including an English-language Overseas Fan Choice Award category. Last year, that award went to prolific voice actor Jun Fukuyama, who played Lelouch Lamperouge in Code Geass and Luca Angeloni in Macross Frontier, among other roles. Who will win this year? That’s up to you! Go to the Seiyu Awards website and nominate your favorite seiyu! Saboten-Con, the upcoming Arizona anime convention, recently held a promo video contest on YouTube. The contestants were ranked based how many views their videos. This tounge-in-cheek short by hbi2k, which uses footage from The Vision of Escaflowne, chalked over 3000 views and won the contest. A couple of us here at PH are planning on going to Saboten-Con. Anybody else thinking about attending?